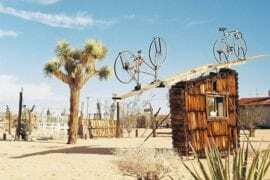 Attracting artists, wanderers, and yogis alike, beautiful Joshua Tree, California is an inspiring destination for a quick getaway or vacation retreat. 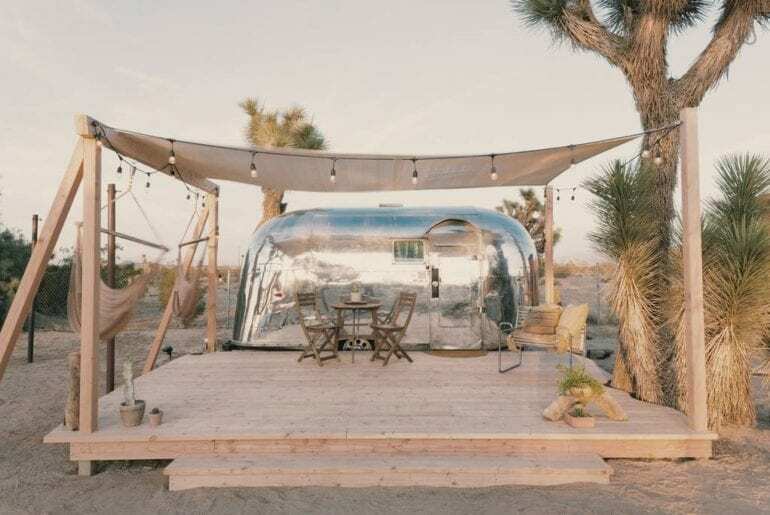 There’s no better way to experience the desert’s mystical allure than by booking one of these unique Airstream Airbnb homes in Joshua Tree! Nearby Joshua Tree National Park is an expansive, protected area of stark desert landscapes and other-worldly rock formations. One of the most famous national parks in America, Joshua Tree draws countless visitors year after year for live music events, hiking, yoga retreats, and much more. 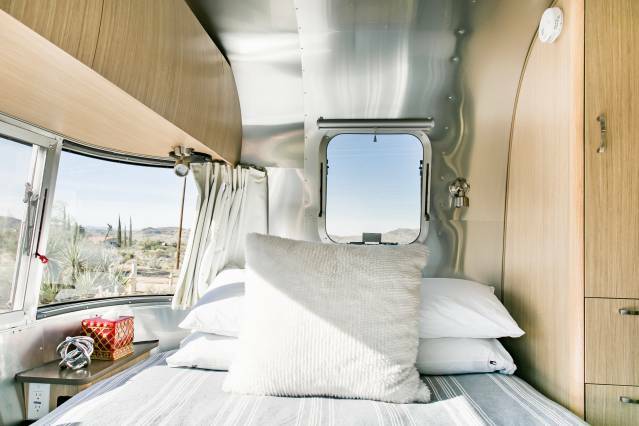 Nature lovers will adore this unique, 25-foot Flying Cloud Airstream Airbnb with stunning desert and mountain views. 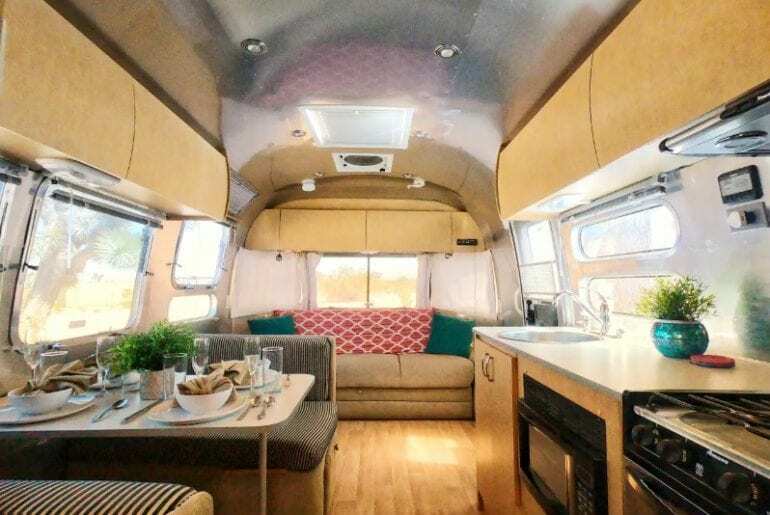 This vintage Airstream has been beautifully renovated with sleek, modern finishings including a full kitchen with stainless steel appliances. There’s a chic outdoor patio out front, perfect for admiring the sprawling desert and mountain views. On cooler evenings, you can switch on the fire pit and cuddle up beneath the glittering stars with your special someone. There’s a private bedroom with a queen-sized bed, tons of built-in storage, and a modern bathroom. The living room has seating which easily converts to an additional full-sized bed to accommodate up to four guests if needed. 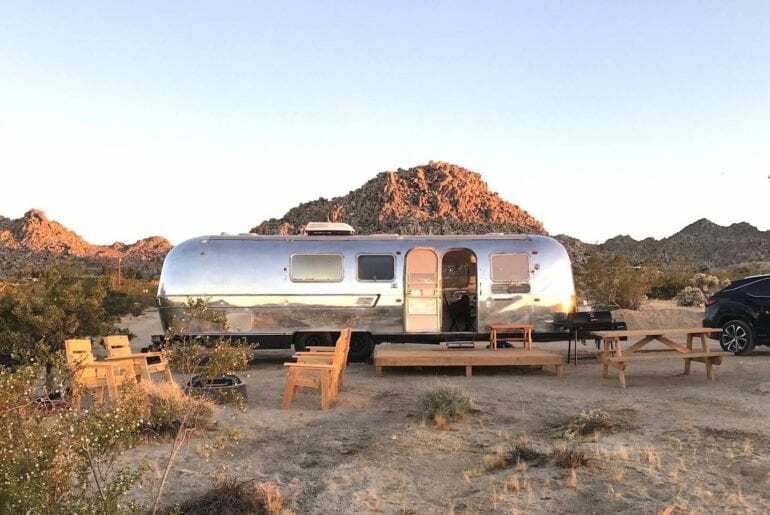 Available from $189 a night, we think this Airstream Airbnb in Joshua Tree is perfect for a romantic, intimate getaway or even a honeymoon! 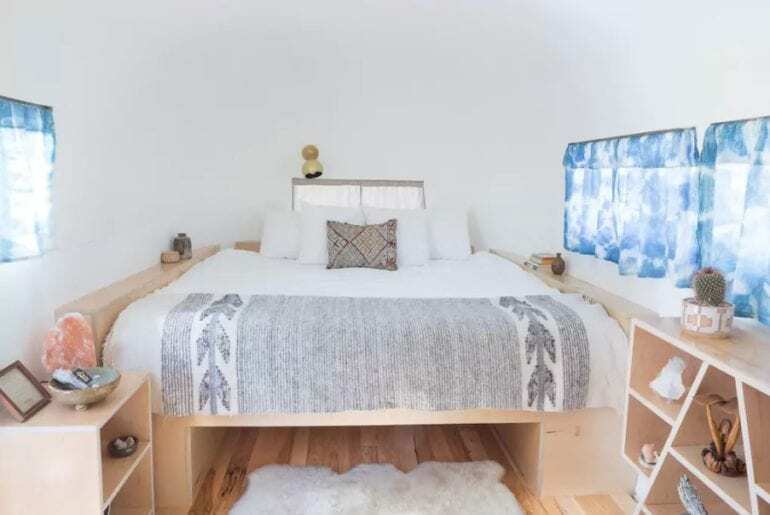 One of the most beautifully-designed Airstream Airbnbs in Joshua Tree is this charming, bohemian Airstream bedroom. 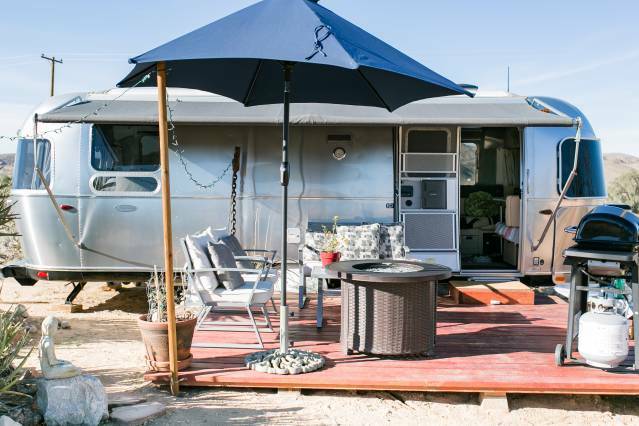 Located in the popular Joshua Tree Acres Airbnb collective, this is one of the community’s newest rentals, made from a renovated 1959 Airstream. Decorated to boho perfection using found objects and eclectic furnishings, this bright and cozy space is perfect for a solo traveler or sociable couple. The private bedroom has a small cafe dining space and a dreamy outdoor patio with two hanging chairs. The shared facilities include a large clubhouse with a large living room, full kitchen, dining space, and a hot tub. 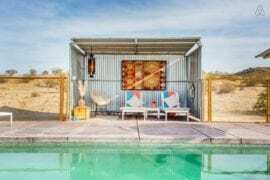 Connect with fellow desert lovers and travelers in this eclectic Airbnb oasis with your private bedroom available from $140 a night. We couldn’t resist including another gorgeous vintage Airstream rental from the stunning Joshua Tree Acres Airbnb. 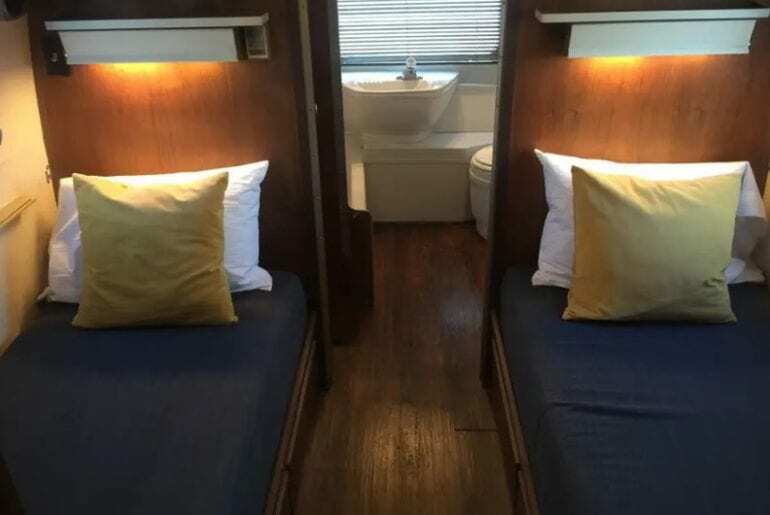 Also available from $140 a night, this renovated 1975 Airstream Airbnb is quite spacious with a private bedroom with a king-sized, Casper memory foam mattress. 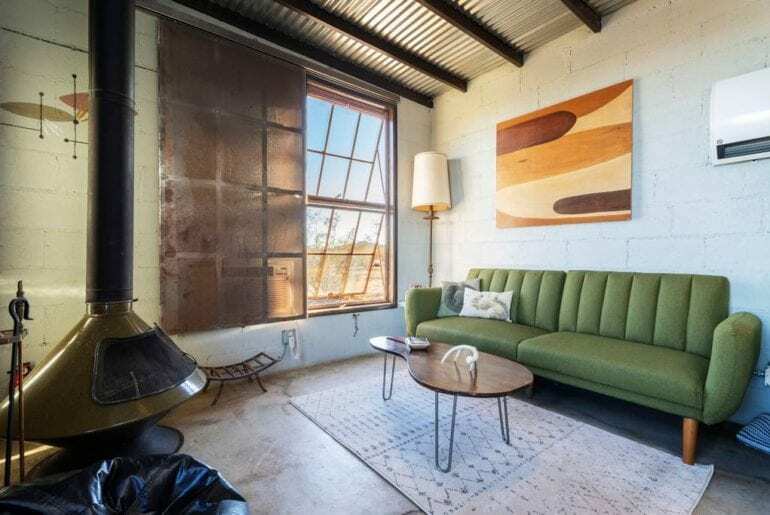 The living space is bright and well-furnished with a large, comfy sectional that’s perfect for lounging and admiring the Mojave desert views. In front of your vintage Airstream is a shaded outdoor deck with twinkling fairy lights, a small dining table, and two comfy swing chairs. This is the perfect place to hang out and watch the sun set or the moon rise over the desert. 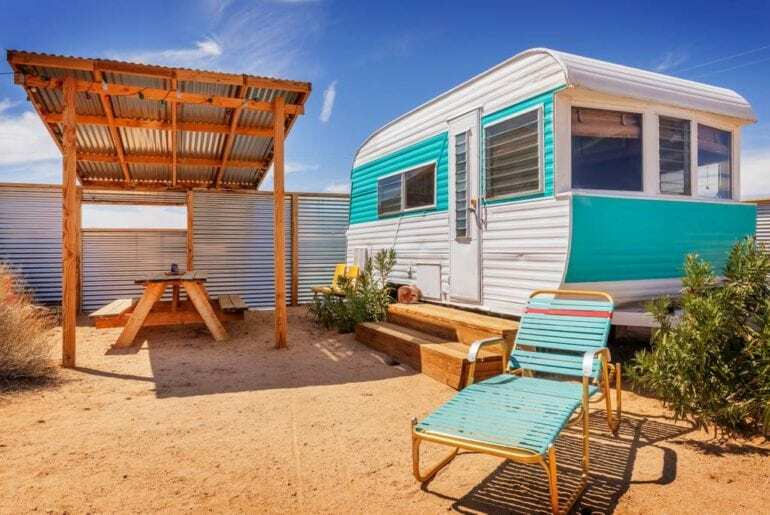 The communal Clubhouse at Joshua Tree Acres has a fully-equipped kitchen, large lounge space, and a beautiful outdoor dining area where you can gather and socialize with your fellow travelers. 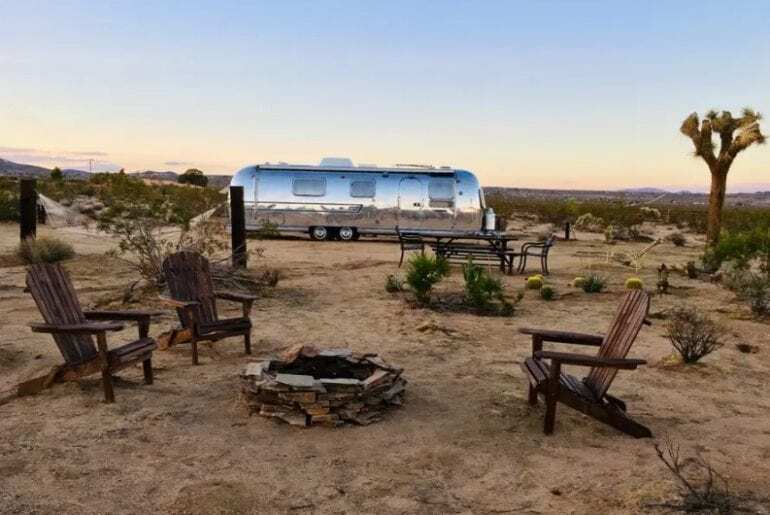 Surrounded by miles of desert and endless blue skies, this is one of the most private and authentic Airstream Airbnbs in Joshua Tree. 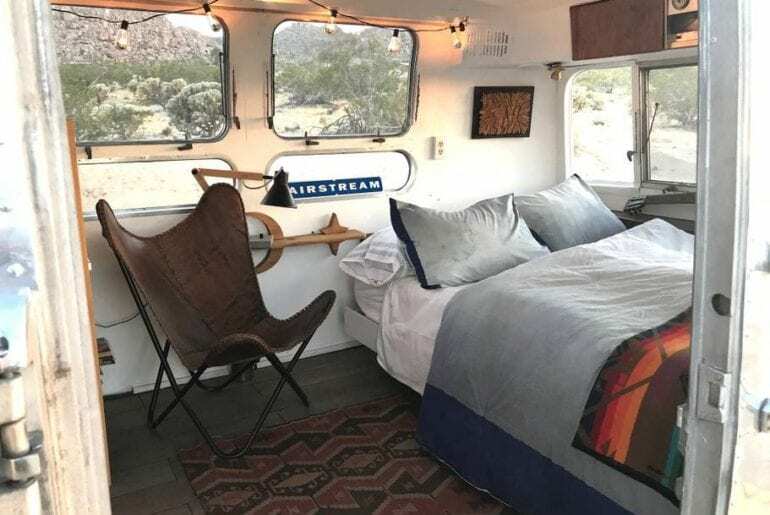 With a queen bed and two convertible sofabeds in the living space, it’s also one of the most family-friendly Airstream Airbnbs in Joshua Tree as it can accommodate up to six guests comfortably. With a nightly price tag starting at $70, this is certainly an epic family vacation that won’t break the bank. 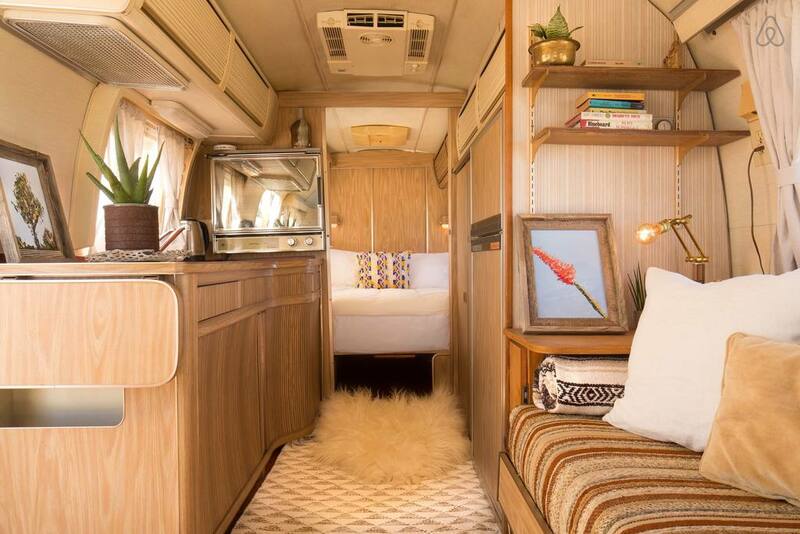 Inside, this vintage Airstream has been thoughtfully renovated in a simple, modern style. 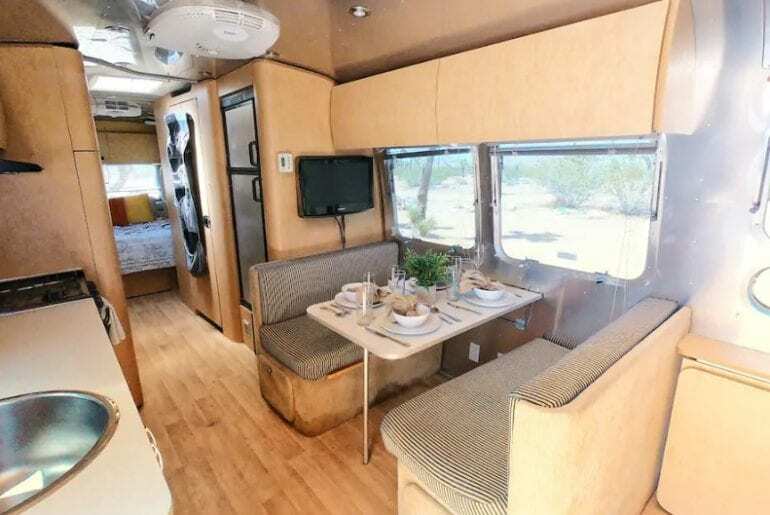 The living area is surprisingly spacious with a full kitchen, dining nook, TV, and two sleeper sofas. Enjoy ample space outside to practice yoga, let your pet roam free, or lounge beside the provided fire pit. 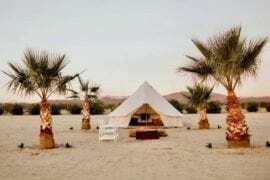 This is the Joshua Tree desert lifestyle, personified. 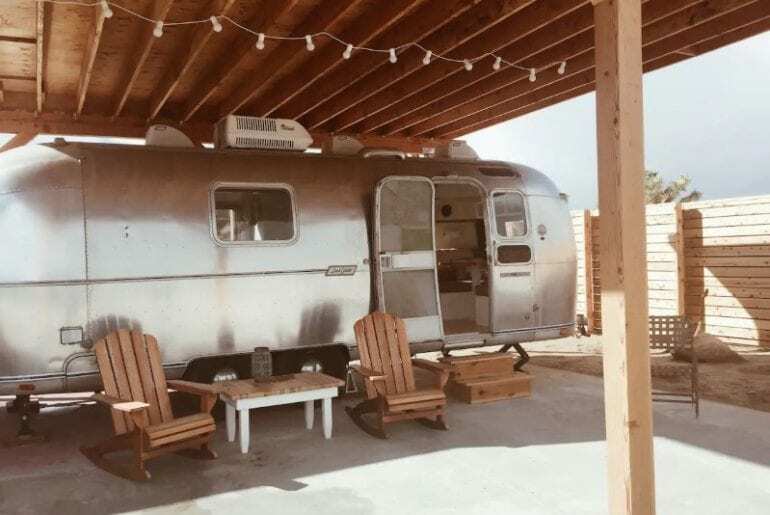 For travelers seeking simplicity and relaxation, this vintage Airstream Airbnb with a separate bathhouse certainly fits the bill. Perfectly positioned on a quiet residential lot, the property is only a 5-minute drive from both the National Park and center of town. 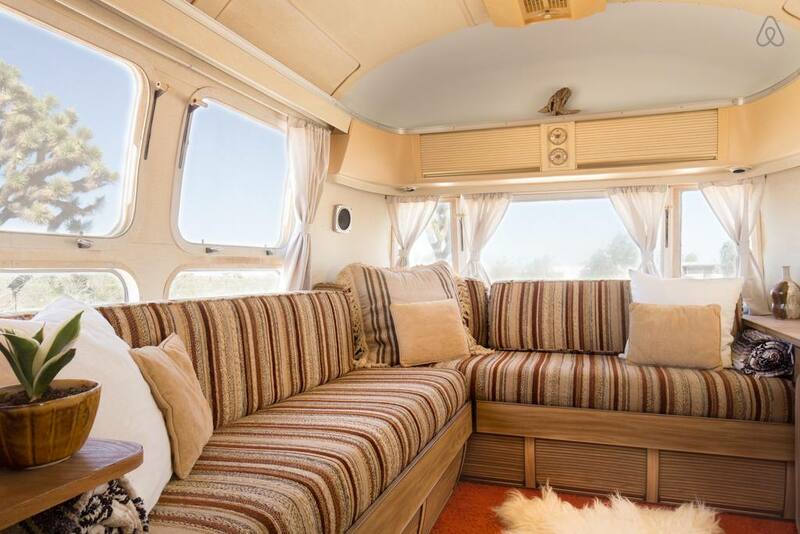 This 1976 Land Yacht Airstream has been beautifully renovated in a simple, modern style. The custom Tempur-Pedic bed has tons of built-in storage above and below, accommodating up to two guests comfortably. 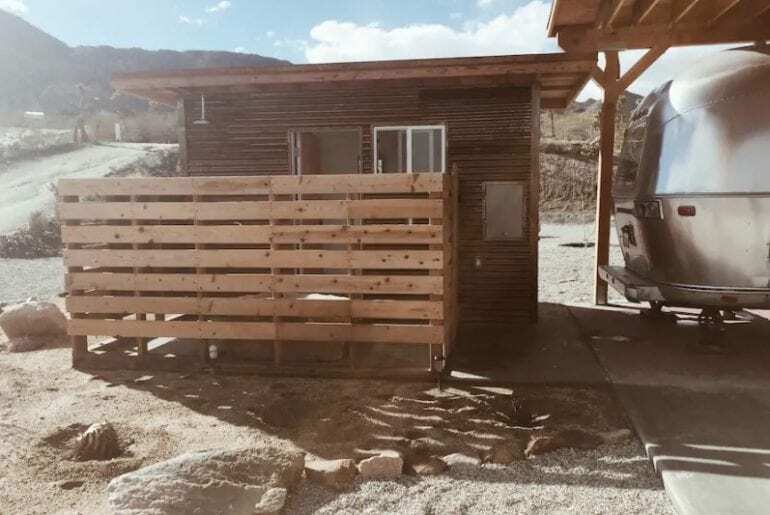 There’s a mini kitchen, seating area, and half-bath inside the Airstream and a separate bathhouse contains your full outdoor shower with privacy fence. Enjoy relaxing on the covered outdoor patio with views of a small cactus garden and sprawling mountain range beyond. This chic and simple Joshua Tree Airstream Airbnb is available from just $110 a night. Are you really looking to disconnect and get off the grid? 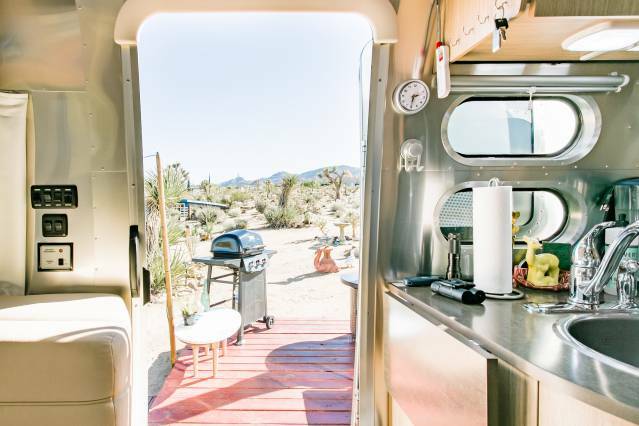 Look no further than this adventurous, solar-power Airstream Airbnb in Joshua Tree. 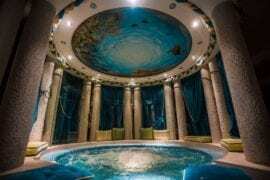 Nature lovers and amateur stargazers alike will adore the sprawling desert surroundings and 360-degree sky views. Count the shooting stars or simply lounge around the fire pit for inspiring late-night conversations. 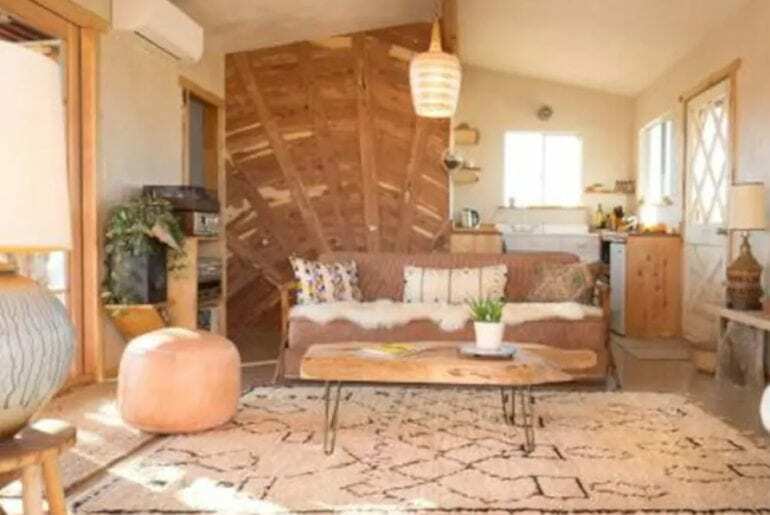 This simple Airbnb can accommodate up to three guests, ideal for a duo or trio of adventurous friends. 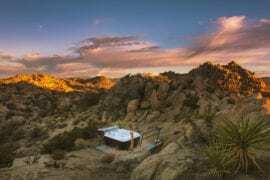 Available from $145 a night, this 31-foot Airstream Land Yacht Sovereign is one of the coolest and most remote Airstream Airbnbs in Joshua Tree. It’s completely run on solar power and self-contained with a simple kitchen and full bathroom with a shower. This is the perfect place to get away from hectic daily life for a little while and truly connect with your travel companion(s). 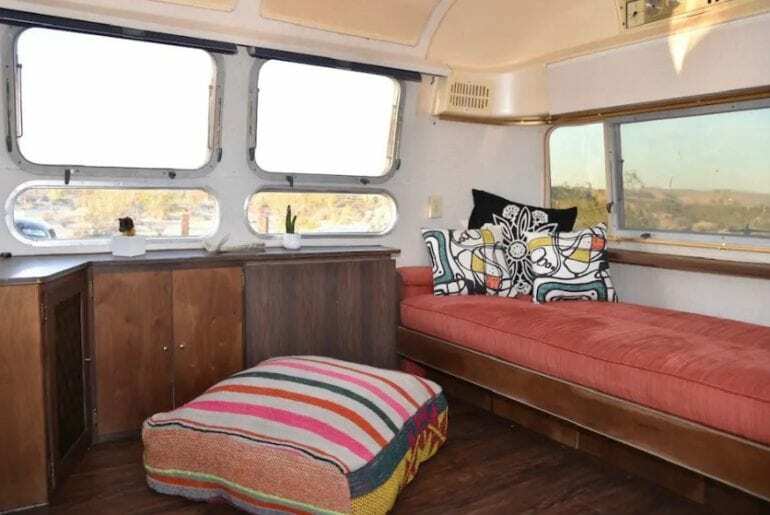 Located just ten minutes from Joshua Tree National Park, this vibrant and funky artists’ trailer is a unique alternative to traditional Airstream Airbnbs in Joshua Tree. This relaxing space is the ultimate desert retreat and it’s available from only $69 a night! The colorful trailer features a queen-sized bed, lots of built-in storage, and a small bathroom with a shower. There are many places to kick back and lounge with friends, both indoors and out. 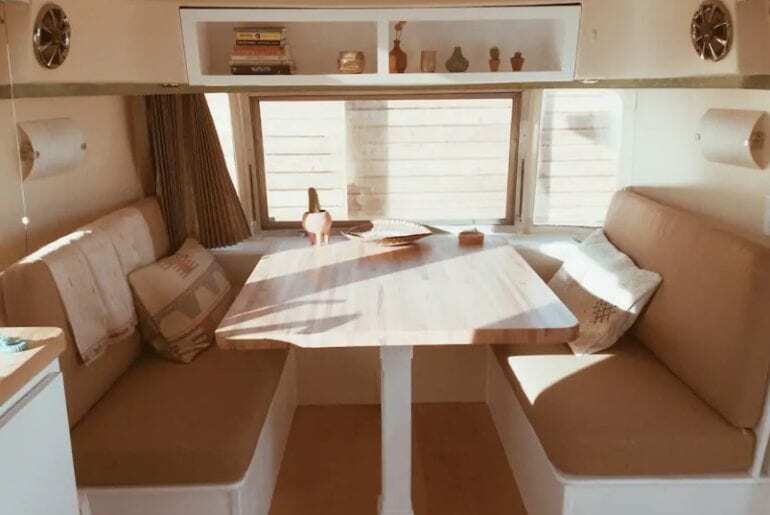 Separate from the trailer is a freestanding homestead featuring a gorgeous living space and well-equipped kitchen. 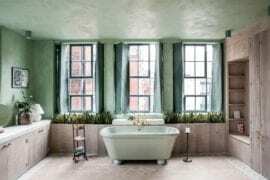 There is a second shower as well as a bathtub outdoors, perfect for a refreshing rinse in the midst of idyllic, natural surroundings. 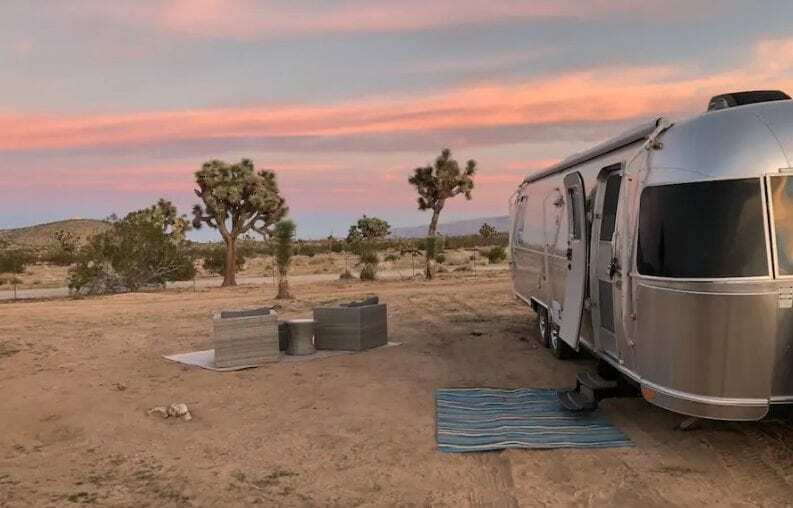 If your family wants to relax and connect with nature, this family-friendly Airstream Airbnb in Joshua Tree could be just what you’re looking for! Located in a peaceful residential area, the rental is a short drive from Joshua Tree National Park as well as the usual amenities in town. 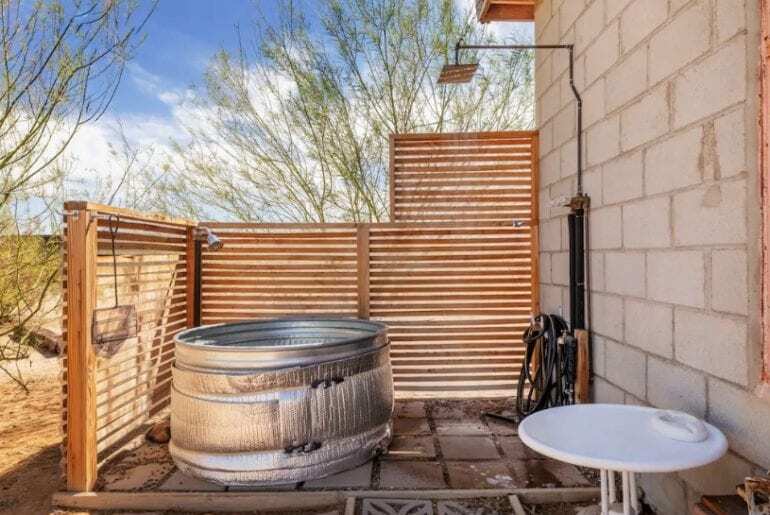 Enjoy getting ‘away from it all’ while surrounded by the magical Mojave desert, from just $82 a night. 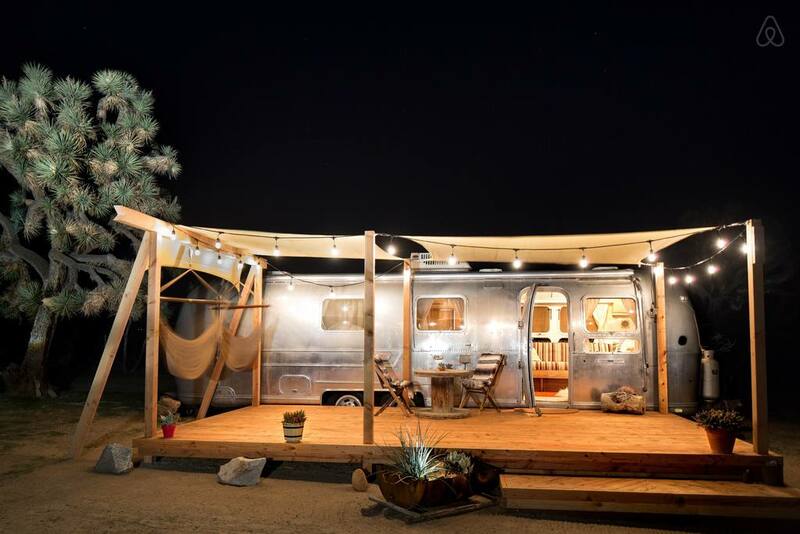 This is definitely one of the most family-friendly Airstream Airbnb homes in Joshua Tree. 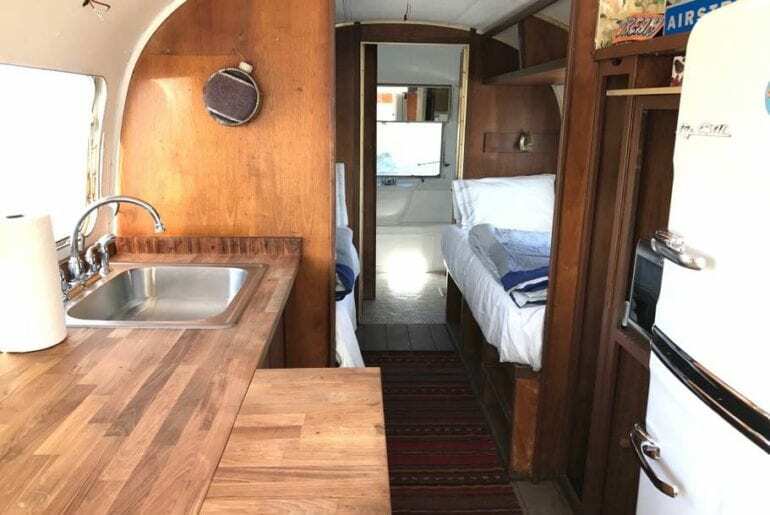 It’s not every day you find an authentic vintage Airstream rental with three beds! There’s a double bed and two twin beds, which means up to six can stay comfortably. 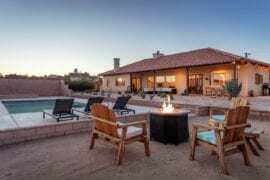 Enjoy a fully-equipped kitchen, bathroom, and outdoor entertaining space with a fire pit, perfect for staying warm on cool desert evenings.